Sometimes a fence is not enough. Think your backyard is a dog's paradise? It could be if it keeps your dog safe and away from the streets. Enclosing your backyard can be an easy or a complicated process, depending on how skillful your dog is when it comes to getting away. Spend some time learning about your dog's personality. Is he a jumper? Some dogs—even small breeds like Jack Russells—are incredible jumpers and can jump several times their height. Other dogs are diggers and can easily dig their own escape tunnel right under a fence. Understanding the kind of dog you have will help you choose the right fence. Build a fence or wall all around your property. If your dog is a bit of an escape artist, some chicken wire buried under the fence will prevent him from digging. If you have one of those dogs who get overexcited at the sight of, well, everything, consider a solid wood or cement wall. That way he won't be able to see what's on the other side and redouble his efforts to get out. An electronic fence is not a good option for dogs who get excited by everything they see—they'll shock themselves nonstop trying to get to whatever temptation lurks beyond the yard. Add a secure gate to the fence. 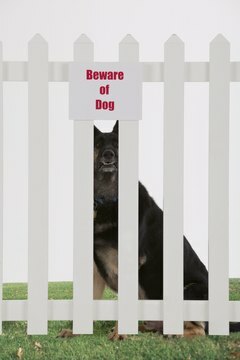 If you have a smart dog, he'll figure out that jumping on the gate a certain way can get it open. If that's the case, you'll need to either get a double latch or add a padded lock to the gate. The best fence in the world is useless if your dog can figure out how to open the gate and just waltz out. Make sure the fence is smooth. Some dogs are excellent climbers and will figure out how to use little dents and holes on the walls or fence to "rock-climb" their way out. Don't enclose your yard using just bushes. Even the dumbest dog will eventually figure out he can squeeze through. You need solid, strong materials if you want to keep your dog in the safety of your backyard. PamGreen.com: Do Fence Me In! Is a Dog Adversely Affected by Changing Homes?